I’ve decided to declare March Female Artist Month as there are many worthwhile Polish women artists to look at, and I realized that I’ve featured only male artists thus far. March seems like a good month because in Poland on March 8th we celebrate Women’s Day. It’s a controversial holiday left over from the communist times. On this day, men give women flowers and other little gifts. I’m sure you can imagine why it’s controversial. On the other hand, there are also many demonstrations and debates organized by feminists. My personal opinion is that if something gets people talking on such a hot topic, it can’t be that bad, and this holiday does just that every single year. 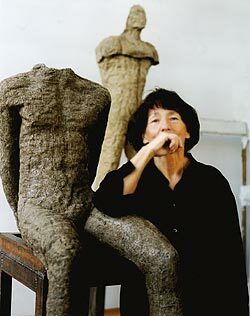 Anyway, I’ve decided to start off with an artist most, if not all, of you should be familiar with – Magdalena Abakanowicz. She’s probably the most famous Polish artist. Even most Polish people who don’t know a thing about art know who she is. What I’m including below is an essay I wrote in 2003 while studying at The School of the Art Institute of Chicago. 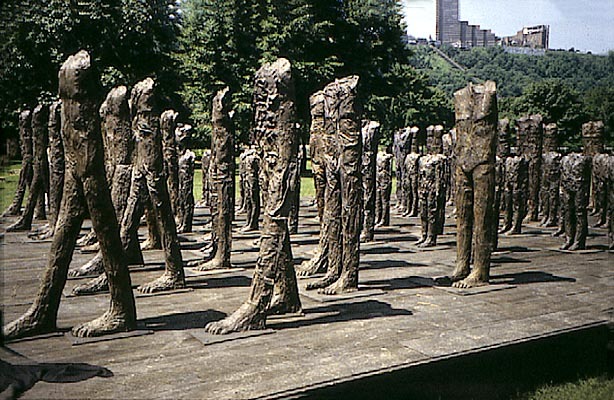 Chicago is a lucky city because in 2006, they got a permanent Abakanowicz installation (image below). I first saw Magdalena Abakanowicz’s Ninety-Five Figures from the Crowd of One Thousand Ninety-Five Figures at the Cultural Center in Chicago in November 2000. I didn’t realize at the time, but the Ninety-Five Figures would have me thinking for the next three years. This piece consists of ninety-five headless and armless figures made of bronze. Their backs are hollow and the skin has a wrinkled texture to it. Looking at this headless crowd, you can’t help but feel solitude as well as melancholy. It reminds me a little of Edward Hopper’s work, because in his paintings, there are people, but they are always alone, they never interact with one another. That is the feeling I get with Abakanowicz’s figures. It is a large crowd, overwhelming in mass because of the material, but it is a lonely crowd. In thinking of that, I started thinking of my everyday experiences. On my way to school or work, I pass many people, avoid them, but never really interact with them. In these large crowds of people, we are always alone. That is a really sad and depressing thought. And I think that is why I have always thought about this exhibit. To have an image impact me so much emotionally is not an everyday occurrence. I mean, I look at a lot of great artwork, but I can honestly say, that there are only a few pieces that I think about constantly. I really enjoy when a piece overwhelms me and submerges me in an experience. That is exactly what Abakanowicz did for me. 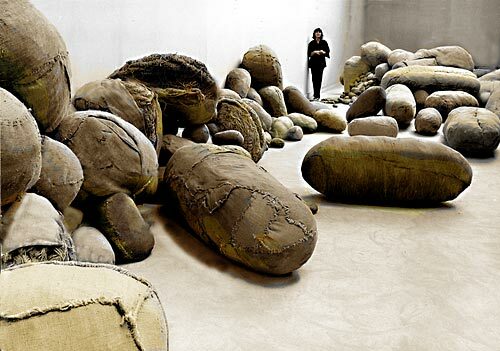 I’m not the only one who thinks Magdalena Abakanowicz’s work is emotionally provocative and powerful. 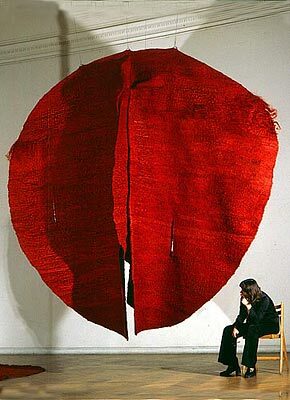 Kathy Zimmerer in her article on Abakanowicz says, “Abakanowicz’s work delves directly into the human sensibility. While mute, her figures resound with a raw emotion and power that is full of psychological tension.” (4) There are so many things you can read into this work. 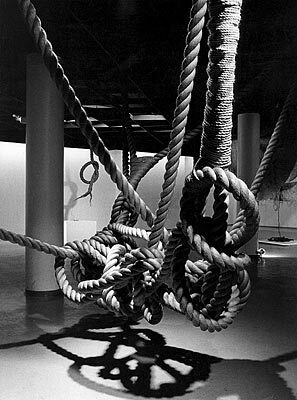 And I think that the artist intends on there being some ambiguity. She wants the viewer to bring into it of their own life, their own experience. Like I quoted earlier, she deals with the human condition, and we are all a part of that.